These have all been caused by long production lead time and high levels of inventory. Both of these problems are related directly to each other and if the lead time excels, there is also a lot of inventory built up as well. You'll understand better if you see the picture of iceberg. It is not an overstatement to say that almost all the costs of a company are hidden behind the problem of these both. Conversely, it can be said that reducing both is the best method of reduction of fix costs and variable costs. 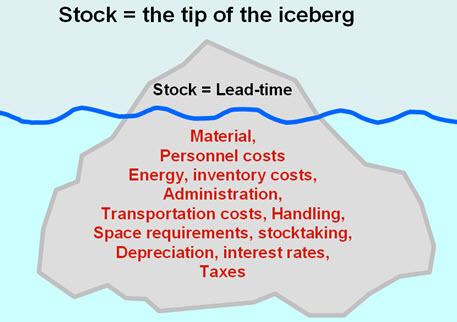 The ability of a company will be reflected in its lead time and the volume of its inventory. A company has a responsibility to two groups. One is the employee who performs the management of the company and the other is the stockholder who offers the funds for it. Obviously, if the employees are not feeling happy with the company and have no pride in their place of work then the company will be unable to generate the results which will satisfy the stockholder in the long run. Therefore, the greatest responsibility of the top management is the bearing of social responsibility, namely, to perform the maximum effort for long-term continuation of a factory. If society is moving at all, focusing on the free economy principle, there cannot be any security which promises the existence of a factory in the long run anywhere. Let us suppose that the product of the factory is accepted in the market and that the factory's manufacturing excels that of the competitor. That is, it is more skillful than the competition and can produce at a lower price. The process quality is high so that the quality cost is low. The process lead time is short so that the cost of work in process is low. The process is flexible so that the finished inventory cost is low. The productivity is high, so that the personal cost is low. Standardization of the design is high so that the material cost is low. The level of production technique is high so that the production cost is low. The level of KAIZEN activities of the whole company is high and the elimination of MUDA in the processes continues so that the cost is low. For the above mentioned reasons the factory is exceeding the competitors and has lower management costs. Always coming out one step ahead of the competition must never flag and you must continually improve the standard of all the present processes. Since your competitors are also naturally performing KAIZEN activities, the activity must be superior to them in content, and the execution must be faster in speed and also more frequent. That is, the manager's job is always 100% KAIZEN. Lean management synchronizes all of the KAIZEN activities currently performed at each section and each group company-wide, ensuring that all the activities are in the same direction, that performing the activity itself is without futility, and that you investigate a cost cutting of a company thoroughly. 1. Fulfill social responsibility through long-term existence of a factory. 2. Contribute to the development of a local area. 3. Contribute to the environmental preservation. 4. Return profits to a stockholder in the long run. The long-term vision of the company should be evaluated and quantified as a business objective. Because, employees must be able to consistency check their track record, the track record of their section, the vision of their company, the business objectives, and management results. Each employee needs to be able to find out their identity in a company, and be able to realize it. In a free economy society in order for the company to survive they have to beat the competition. Develop competition of a product, competition of improvement in quality, improvement in service, reduction of lead time or stock, improvement of productivity, and the cost competition to which continuation of the company was finally applied. Since at each company the company-wide improvement activities are always repeated for the sake of survival, KPI(s) such as the productivity of a company can not be the same as last year, naturally the figures are reset up every year. A company's result depends on the process standard of a factory. That is, the level of the method and system is a problem. There are many techniques in a production system、for example, tact time production system, one piece flow production system, pull system, process leveling system, Kanban system, quality management system, supplier management system, etc. Even if improvement in the company's results is realized, you must always improve the standards of the methods and systems of the present processes. 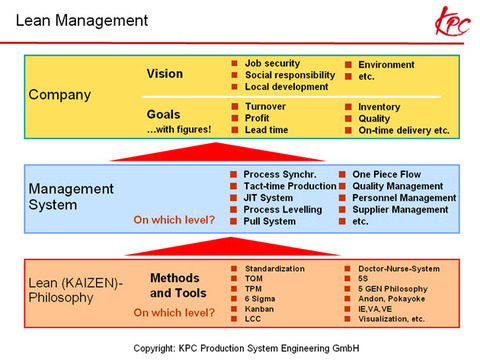 Although "Kaizen" of a factory is a general term that is now understood globally there are various tools like 5S, standardization, a doctor nurse system, TPM, and TQM, six sigma, IE and VA, and VE. There are various techniques for quality management etc. Used with kind permission from KPC.